Ezra Furman’s first two albums were unabashedly influenced by The Violent Femmes and the ’64 incarnation of Bob Dylan. That’s okay. They were really great Bob Dylan/Gordon Gano pastiches. 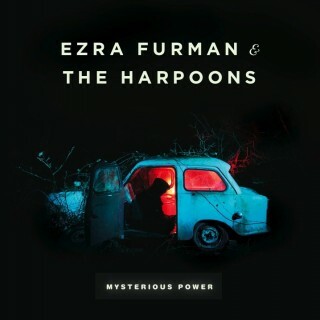 But on new album Mysterious Power, Furman seems to have found his own voice. The nasal yelp will still remind you of great misanthropes and smartasses from the past, but the songwriting, for the first time, bears the distinctive imprint of a first-rate original storyteller. Furman’s schtick — “I’m just a kid without a care in the world, all a-spin” as he so concisely puts it on closer “Wild Feeling” — will resonate with anyone of any age who faces the daunting task of making sense of the kaleidoscopic, conflicted reality of life on planet Earth. That breathless approach comes through loud and clear, not only in the hyperactive emoting that constitutes Furman’s singing, but in the careening folk-punk of backing band the Harpoons. It’s a wild, joyous ride, so hold on tight. It starts out somberly enough. “Wild Rosemarie” is a new kind of song in the Furman repertoire, a quiet, rueful look back on a doomed relationship that may have ended on the shoals of alcoholism, or in a crashed car in the dark waters below a bridge overpass. It’s a lovely song, full of regret, tinged with tragedy. But from there Furman unveils the magic tricks. “I Killed Myself But I Didn’t Die” is a typical Furman tall tale, a surreal stomper propelled by a Pixies-like bass line and an overdriven electric guitar. “Hard Time in a Terrible Land” is a punk blues number that serves as both a social commentary on the current economic recession and a theological treatise on God’s inscrutable wisdom. The disarmingly pop-driven title track and first single “Mysterious Power” plays the “aw shucks, I’m just a kid” card for the first time, but in this case the kid tries to come to grips with the ineffable, mysterious meaning of God and life and death. It’s the Paul McCartney version of The Brothers Karamazov. And on and on it goes, from the sprawling Dylanesque ramble of “Don’t Turn Your Back on Love” to the demented doo-wop of “Bloodsucking Whore” to the gentle folk coda of “Wild Feeling.” To be fair, Ezra’s reach still sometimes exceeds his current abilities, and he’s capable of some wince-inducing moments as well as songs of poetic genius. But it’s refreshing to hear a young songwriter with a singular vision going for the jugular every time. Wherever that mysterious power comes from, keeping asking the questions, and keep spinning, kid.